The 233 is the ultimate troubleshooting multimeter, with a detachable display that lets you to monitor hazardous environments remotely. An electrician’s tester best suited to diagnosing issues in industry, it allows you to be in two places at once and work alone, where two people would normally be required to carry out a specific task. This is a True RMS multimeter, able to accurately measure complex AC drive outputs. There are also capacitance, temperature and millivolts ranges, and in the Fluke 233 review, it boasts all the ruggedness and reliability that Fluke is renowned for. Industrial plants are typically more hazardous today, with complex, power-hungry drive equipment increasing the risk of spikes and surges in high-voltage/current environments. The potential effects to measuring equipment are thus more damaging. While Fluke’s multimeters have the input protection to generally negate this, the need for a remote measuring device has always been on the cards. 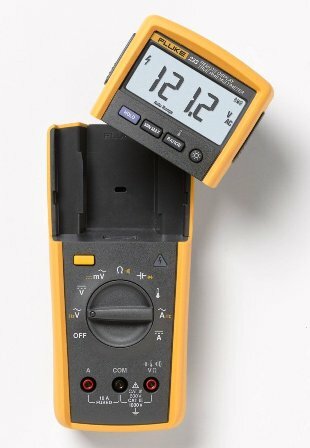 The Fluke 233 was specifically designed to help out those who cannot hold the meter and be near the test piece, such as in hazardous areas or clean rooms. The 233 gives you 33ft (10m) of safe distance and there is a magnet on the rear of the display so you can pop it up on a panel. The 233 is a typical multimeter at heart, able to measure 1000V AC and DC, along with AC and DC current to 10A (up to 20A for 30-second bursts). It also measures down to the milliamp range and comes with a dedicated millivolts position. In addition are a generous resistance range, as well as capacitance and frequency and a fast continuity checker. A range button lets you switch between auto ranging and manual ranging. Being a True RMS meter, it allows you to measure all sorts of AC drives more accurately than you would with a normally responding ‘average RMS’ device, which could be 10% out or more. To make it truly useful, the 233 also has a pretty wide temperature range on a dedicated dial position to over 750°F – unit operation range is up to 122°F. It is able to display in both Fahrenheit and centigrade. Other useful features on the Fluke 233 include a Min/Max (and average) recording mode and Fluke’s famous auto hold feature. The latter lets you pick up a reading and freeze it automatically, as opposed to having to press the hold button during measurement. The main downer is that it does not sport a micro-amps range, so is not so useful for electronics work, but then again it was built as an electrician’s multimeter for fault finding in hazardous areas. Best Suited To? : This is an electrician’s multimeter, best suited to industrial use, plus it is also very useful in the vehicle repair industries. The 233 is also recommended for those into HVAC and it is user-friendly enough to be operated by trainees. The 233 is a ‘Made in the USA’ Fluke, meaning it has assured attention to detail over the put-together-in-China models, of which it sometimes indulges. The whole thing from case to circuit board is well made. The tough case is partly enclosed by Fluke’s trademark yellow rubber holster, which is of the integrated type, plus on the rear is a tilting bail and battery compartments – one for the meter, one for the display. As well as being detachable, the display is manufactured with a sloping base so that it better projects the readings to the user when sat on its own. When it is removed, there are no contacts or wires. It has infrared connectability, together with its RF, wireless connectivity. This keeps both moisture and dust at bay. The leads have nice, supple cables and feature sharp tips, which are better for probing into small contacts. The alligator clips that are included with the meter are well insulated. The display is on par with other higher end Flukes, is backlit, and of course has the advantage of being removable. It is a 6000-count, 3 5/6-digit unit, with a refresh rate of four times a second, so it easily deciphers fast changing values. Unfortunately there’s no bar graph on the 233, but the screen is nice and clear and shows all icons. Low battery symbols pertain to both the meter and the display and there is also a wireless symbol which is displayed when the screen is detached. The rest of the facade is typically Fluke, with easy to read, color-coded symbols around the dial and clearly marked input jacks underneath. The buttons are a part of the display and are usable when detached, to include hold, min/max, ranging and the backlight. The backlight stays on for 40 seconds. Aside from capacitance, which shares a position with the diode test function, all other ranges have their own positions. A yellow selector button switches to the diode test and DC millivolts, as well as frequency on the AC voltage and current positions. You can also disable the continuity beeper with this. The five AA batteries (three in the meter, two for the display) are touted to be able to power this unit for up to 400 hours. Bearing in mind that prolonged use of the backlight, as well as having the display detached, increase battery draw. This is due to the radio transmitter, which shuts off when docked with the meter. There is an auto power-down (sleep) feature, which kicks in when there is no activity for 20 minutes. There are just the three jack sockets on the Fluke 233, since there is no dedicated milliamp or micro-amp range. Of performance, it is as fast as any other top of the line Fluke multimeter, with impressive auto ranging and continuity functions in particular. The amperage circuit of the Fluke 233 remote display multimeter is protected by an 11A HRC fuse. The safety rating is category IV 600V (able to safely read service side in industry) and category III at 1000V. The level of input protection of the 233 is able to cope with transients at these high energies, which you might not get with other brands. In addition is an overvoltage light in the upper right corner of the main body of the meter. External protection is provided by a rubber, over-molded boot. With the Fluke 233 review, we have a very capable professional multimeter that is tailored to working in hazardous places. Although not especially suited to intense electronics work, it measures most ranges accurately and comes with Fluke’s assured reliability, toughness, and most importantly, great input protection. Alternatively, the rugged 28II offers waterproofing and may suit those who have a need for measuring down to micro-amps.